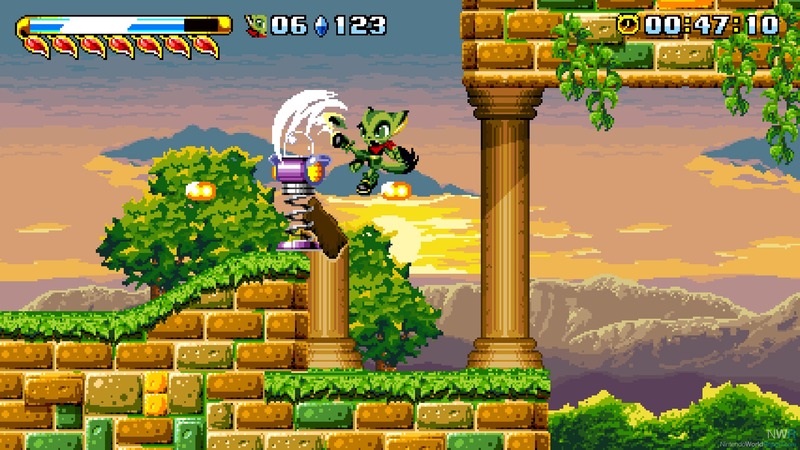 Those who are familiar with GalaxyTrail Games’ project Freedom Planet will be aware of its origins as a fan-created Sonic the Hedgehog game; a lovingly crafted Sega Genesis-era inspired title that sought to continue the series’ excellence where Sonic 3 & Knuckles left off in 1994. That project eventually became Freedom Planet, replacing Sonic and friends with original characters, and a plot that stands out as darker material than anything Sega ever attempted in the 16-bit glory days. The final product is a well-polished 2D platformer that incorporates elements from the best of the Sonic games, yet manages to stand on its own two legs as a fine game in its own right. At the start screen, players are allowed to select between two different modes: Adventure and Classic. Adventure mode contains cut scenes that tell the narrative between levels, while Classic mode is more of an homage to the olden days, where the player blasts through levels without much in terms of a story other than what they can glean from the animated sprites and backgrounds. What this choice really boils down to is whether or not you think the story is one worth exploring, or if you’d rather just experience the gameplay alone. If you do opt for the Adventure, I’m glad to say that the plot succeeds much more often than it fails. We enter the story as the big bad guy Lord Brevan and his alien army invade the planet in search of the Kingdom Stone, an ancient hunk of rock that contains unlimited energy. In his search, he sets in motion a plot to bring the three kingdoms of Avalice to war with one another. He is soon followed, however, by another ship piloted by an alien named Torque, who crash lands on the planet. Nearby, our heroes, Lilac the Dragon and her best friend, Carol, hear the crash and decide to save Torque, who warns them of Brevan’s plans. From there, the plot introduces several likeable characters, some fearsome enemies, and an action-packed finale that, for the most part, delivers. The only grating part of the story is that some of the voice work can be annoying for certain characters. Depending on which mode you choose, there are either two or three playable characters. In Adventure mode, the game allows you to choose from the start whether you play as Lilac or Carol, while Classic mode adds Milla as the third possibility. Each character has their own special moves and abilities that can add or subtract to the difficulty of the game. 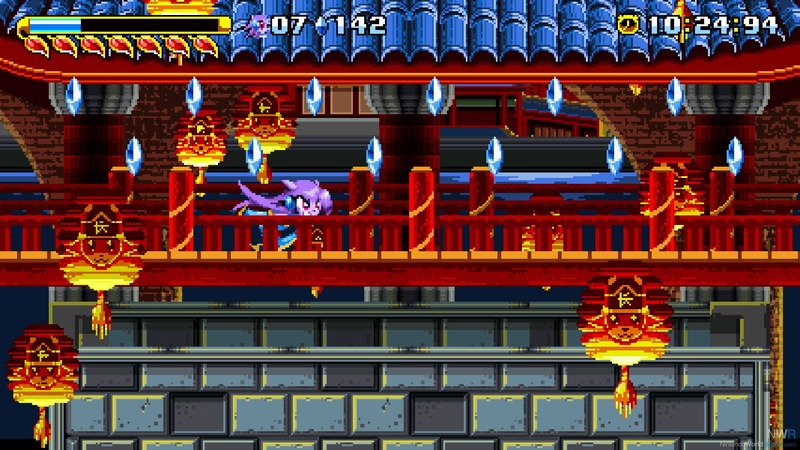 Controlling Lilac, for example, gives the player more health and an air dash move, while controlling Carol allows you to ride a motorcycle and stick to walls. Each character has their own strengths and weaknesses, and it’s a challenge figuring out how to reach your goal with each one. If you’re worried that Freedom Planet is a direct copy and paste job of previous Sonic titles, rest assured that this game comes with several improvements to the speed-platformer formula. The developers wisely chose to leave out the rings-as-health system, and have replaced it with a more standard method of losing and regaining HP. Your health is represented by red leaves, and can be replenished by defeating enemies or finding the leaves scattered throughout the stages. Your special attacks will also consume an energy bar, so you’ll have to choose the timing of these attacks wisely, especially in boss encounters where one wrong move can prove deadly. In the Genesis Sonic games, pacing could sometimes be an issue; it was all too common to slam into something while running at top speed, and seeing what was further in front of you was difficult due to limited technology at the time. Freedom Planet’s pacing throughout the stages is, for the most part, better in this regard. The levels are bigger than any you’d find in a standard Sonic game, but this allows for some breathing room between enemy and obstacle encounters so that the player doesn’t feel overwhelmed. Speaking of enemy encounters, the design for the robotic foes you’ll face is excellent. There’s a wide variety of enemies, which gives each level a unique challenge and keeps the player from becoming bored with running into the same old, rehashed creatures that is an all too common trope for this genre. Some enemy types must be hit in certain weak points to be defeated, while others can be used to remove obstacles in your path. Boss encounters, likewise, vary in challenge, and several of them are memorable for both their fantastic animations and the intense challenges they provide. One complaint that I had about some of the bosses, though, is that figuring out how to defeat them and dodge their attacks can be very trial-and-error based. This means that, often times, it is overly difficult to defeat them upon your first encounter, which felt a little unfair to the player after reaching the end of the level. That said, the game balances this by giving you frequent checkpoints, so that your progress is restored immediately before the boss battle should you lose a life. This lessens the frustration that comes with death to the hands of your giant foes. Freedom Planet comes in a little on the short side, especially so if you choose to opt out of the story mode. Sure, there are time trials to complete after you’ve finished the main campaign, and playing through the game as the other two characters offers some replay value, but I couldn’t help wanting more stages at the game’s end. The stage design and character animations are bursting with a lot of charm and creativity, and I wanted to remain in Avalice a little longer. Maybe this is a good thing, though, as I’d rather end a game wanting more than feeling exhausted, but it’s something to be noted. 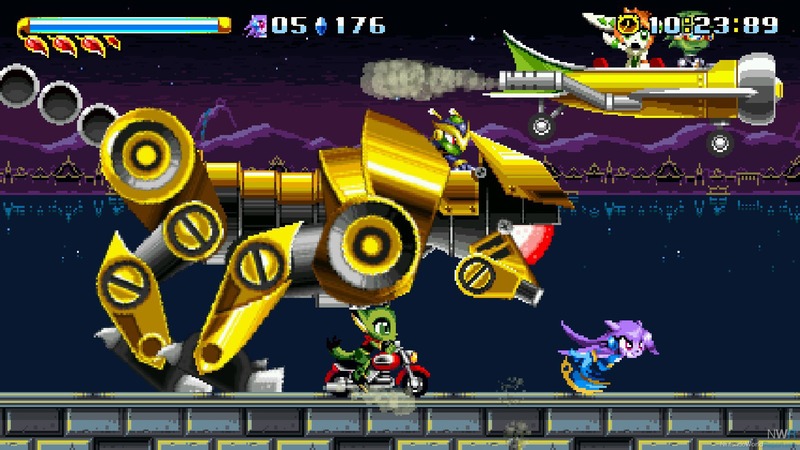 If you’re a fan of sprite-based graphics, then Freedom Planet has a lot for you to gander at. The characters and enemies are animated beautifully, and the stages are all uniquely designed with tons of creativity in the environments. There are certain stages, too, that have battles raging in the background, which are wonderful to stop and watch for a minute before you speed along to your next encounter. From the intro cut scene until the finale, you’ll marvel at some of the set pieces on display. It looks like the best of the best when it comes to games inspired by Genesis-era graphics. The game’s music also highlights the wonders of a bygone era. While it never quite reaches Sonic 3 heights, there are some catchy tunes that add to the player’s enjoyment. When it all boils down, Freedom Planet is the best Sonic the Hedgehog game I’ve played in years. Even better is that it takes the Sonic formula and tweaks it enough to make it its own. Add to that an interesting plot, three playable characters and some really creative stage design, and GalaxyTrail has a potential eShop hit on their hands. If you’re a fan of Sonic, or 2D platformers in general, this is a can’t-miss game. that being said, a thing I sometimes challenge folks to do is to describe it without directly referencing Sonic, and folks usually immediatley crutch on Rocket Knight, Gunstar Heroes, and maybe some more obscure Sega Saturn stuff. Also, I'd take Jade Creek 2 or the Pangu Lagoon stuff over a good 99% of FM Synth, including the iconic melodies of S3. That being said, I do feel it's a little unfair to Sonic Team and DiMPS' efforts on Sonic Generations to say Freedom Planet is objectively better. they both have their strenghs and weaknesses, and I don't think Lilac would work if you just plopped her into a Sonic Level, nor wold Sonic work if you needed him to try and circumnavigate the bullet-spam laden areas of Battle Glacier or Final Dreadnaught. If I were on staff here, I probably would have begged for this review. I really and truly love this game. Ran into a freeze during a cutscene, one after Fortune Night with the big bad. However, apparently it's an issue that GalaxyTrail is aware of, as this Miiverse post shows.